Wheelbarrows, carts and wagons have been an integral part of the Amish way of life for many, many years. They use them in their every day life and need them to be expertly construction and fully-functional which is why all the wagons and wheelbarrows in this collection are made to be used on the farm or backyard. You can use this for pulling around your yard debris and garden harvests or you can set it in the yard to be used as a herb garden or floral display with the galvanized steel liner. 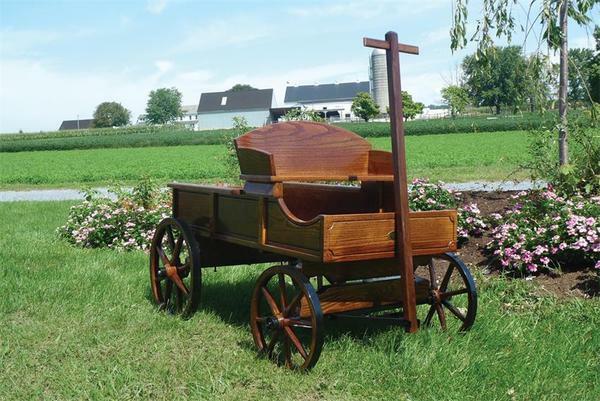 This particular rustic wagon features un-sanded wood and untreated hardware, both embellishments designed to give the wagon a truly weather and rustic look and feel. Our woodworkers are also happy to transform this piece from garden wonder to indoor coffee table by mounting your choice of glass or mirrored table-top over the wagon's body. Simply select your preferred surface from the menu above! Choose from a wide range of shades to find your perfect color for this beautiful wagon. Visit us in Sarasota, Florida at our store near the Pinecraft Amish community. You can also call us at 1-866-272-6773.